The newest edition to our yearly lineup, our Hop Burst Series is a new group of IPAs that feature a late addition of hops. By adding a massive amount of hops to the end of the boil, the beer gains hop flavor and aroma without becoming overly bitter. Our Hop Burst Series is continually rotating, which means each batch will have different hops and different flavors. These are available on draft only, so make sure to grab a pint before it's gone. Every once in awhile a beer comes along that we just can't get enough of. We drink it every day after work, we take it to all of our friend's parties, we recommend it to all of our customers. Let us tell you, Passionfruit Gose is not that beer. Passionfruit Gose is better than that beer! With 4 pounds per barrel of real passionfruit puree added during primary fermentation, the tropical flavor in this beer shines though, but is not overwhelming. It's a beautifully balanced beer, with both the passionfruit and the tart, slightly salty gose complementing each other while still being stand alone players. As if the harmony between sweet passionfruit and tart gose wasn't enough, we've dry hopped this beer with a generous amount of Citra hops -- a half pound per barrel in the drop hop, to be specific. The juicy, tropical Citra hops give it a citrus undertone and a slightly dank flavoring. Our Head Brewer, John Egan, was excited to brew this Passionfruit Gose because of the uniqueness of the flavor profile. He likens the "funkiness" from passionfruit to something you pick up in certain yeast strains and bacteria. This beer leaves nothing to be desired and satisfies even the pickiest beer drinker. You can pick up a bottle or two (and a pint while you're at it) in the tasting room today, or check our beer finder for locations serving it near you. Help us save Soi Dogs! Join us on Friday, January 13th for a night of good beer, cute dogs, and a fantastic cause. We're joining forces with The Barking Lot and Thailand's Soi Dog to help get some cute puppers adopted. The Barking Lot made the long trek over to Thailand to help rescue 12 dogs from the illegal dog meat trade. These dogs are now stateside and looking for their forever homes! The Barking Lot has begun partnering with the Soi Dog Foundation to help them put an end to the illegal dog meat trade in Thailand and surrounding countries. To date, The Barking Lot has taken in 26 dog meat trade dogs who have braved the 24 hour journey from Phuket to San Diego. These dogs have endured a horrifying existence prior to being rescued and deserve a loving forever home. This is your opportunity to come meet all the inspiring and resilient Soi Dogs. We'll have fresh beer, a food truck, and a raffle where you can win a Giant Simple Three beach cruiser! Click the links below to view coverage on this event from 10News and CBS8. Everyone's favorite week (well, ten days) of the year starts tomorrow! Check out everything that we've got going on for SD Beer Week. Come try the next beer in our Brewer's Series -- Taste Of The Glory! This SMaSH beer (single malt and single hop) is refreshing and light. Purchase a pint and keep your glass. Join us for an evening of barks and brews as we host Lab Rescuers. Live music by The Hickory Wind Band, free food, and a raffle. Test your beer knowledge in a special edition of our weekly trivia. It's free to play and there's no limit to team size. Bring in the puppers because we're having a Beer Week Yappy Hour! 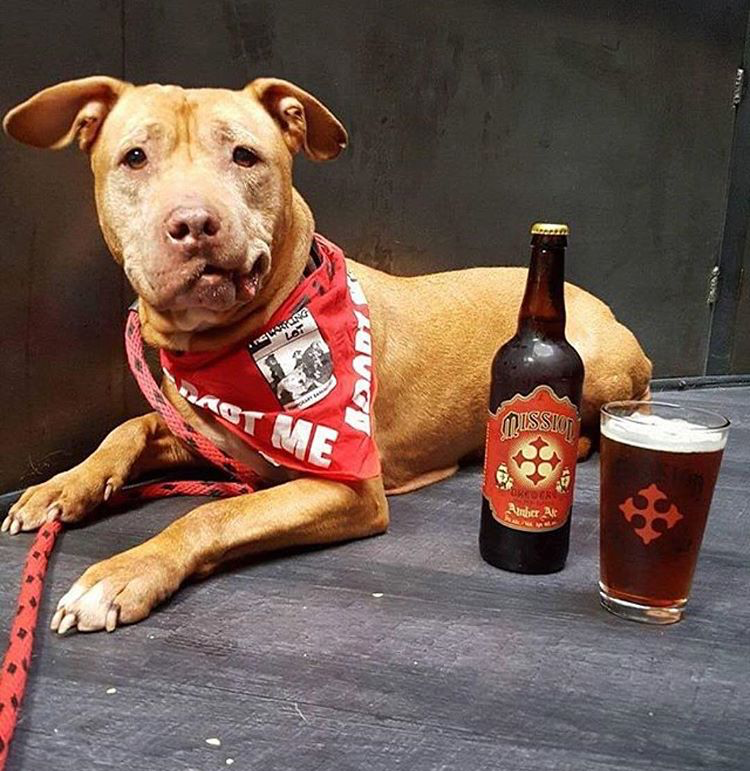 Free treats from The Honest Kitchen for your four-legged friends and fresh craft beer for you. We're teaming up with our friends from Donut Bar, Carnitas' Snack Shack and Pueblo to bring you the pairing to end all pairings! Each restaurant will be bringing a specialty, hand-crafted dish to pair with two of our hand-crafted beers. Tickets are $40 and include 6 food tasters and 6 beer tasters. Indulge yourself in handcrafted vegan sweets paired perfectly with our craft beers. Tickets are $20 at the door while supplies last. Every day during #SDBW we'll have a beer and truffle pairing available. Andrea from Andrea's Truffles has supplied us with decadent truffles to pair with our beers. Ask your bartender if you're interested in the pairing. Pairing is $20 and is available while supplies last. Last weekend some 60,000 beer-loving people descended on downtown Denver to try beer from over 750 breweries from around the US. We were a small fish in a big pond of beer. If you're not familiar with the Great American Beer Festival, you can check out it's awesomeness via photos here. Needless to say, we had a fantastic time hanging out with friends from home, friends we just met, and, of course, drinking delicious beer. Although we didn't take home a medal in the prestigious ceremony, a whole heap of our San Diego friends did! We are proud to live in a city that loves beer just as much as we do. A HUGE congrats to everyone -- keep killin it! Check out a run down of all San Diego winners here. Outside food is always welcome! Bring in the pups for free treats while you sip on craft beer. Come spend your weekend with us, enjoying delicious craft beer. Check out our newest offerings below. If you haven't tried our MX Lite yet we recommend swinging by by to give it a try! This light Mexican-Style Lager comes in at a low 3.8% and is an easy drinker for those warm Indian Summer days. It's refreshing and crisp, with a slight malt backbone. Hopped with two and a half pounds per barrel of Falconer's Flight, this IPA is well-rounded and balanced. Grapefruit, lemon and pine flavors compliment each other without being overwhelming. Just 45 miles northeast of Mission Brewery lies a beautiful, hoppy farmland - Nopalito Farms. A family-run business that is surviving the Southern California drought, Nopalito Farms possesses 2.5 acres of certified organic hops. Head brewer John Egan, went on a search for the best and most fresh hops to use in our wet hop pale ale, and stumbled across Nopalito Farms by no accident. Growing up in Fallbrook near Nopalito Farms John knew he wanted to support the local, family-run business. Jacob Brownwood of Nopalito Farms is also a former Mission employee and an all-around great guy. John chose Cascade and Chinook hops because they’re classic American hops that make for a classic American Pale Ale. Brewed with 4.5 pounds per barrel of Cascade and Chinook wet hops, this beer has a juicy aroma and flavor, complimented by a slight pine undertone.